Fabric sensory properties are complex concepts which include dimensional changes at small forces such as tensile, shear, compression and bending, surface properties (friction and roughness) plus surface coolness or warmness. The aim of this study was to investigating the effect of weft yarn twist level on sensorial comfort of 100% woven cotton fabrics. Five cotton fabrics were woven with incremental weft yarn twist levels and their tensile and shear strength, pure bending, compression, surface friction and roughness were evaluated using Kawabata Evaluation System and compared. The other sample parameters such as count, thread density and fabric structure were kept constant. Fabric water permeability and its wicking ability were also evaluated. The results showed that as the twist level increased, the fabric tensile, shear and bending properties also increased. This was observed in both the warp and weft direction. At higher level of twist, lower surface friction, less compressibility, less slipperiness (0.264 warp and 0.199 weft direction), rougher surface (0.026 warp and 0.020 weft) and less even surface (2.643 warp and 1.998) were observed. The wicking ability also reduced with the increase in twist level while there was an improvement in water permeability. Generally, comfort is considered as a fundamental property when a textile product is evaluated. Clothing comfort is a multi-criteria phenomenon that requires simultaneous fulfillment of a number of conditions (Karthikeyan et al. 2016). Quality of clothing depends on many factors including its comfort property (Matusiak and Fracczak 2017) which comprises primarily of three aspects: psychological, thermo-physiological and sensorial comfort (Oglakcioglu et al. 2009). Sensorial comfort, usually described as “fabric hand or feel”, is the sensation of how the fabric feels when it is worn next to the skin. It is related to attributes like physiological comfort, for instance when a fabric is wet, its sensorial properties changes and fabric may cling to the skin giving a chilling effect. Wet feeling and clinging causes sensorial discomfort in situations of profuse sweating like in firefighters’ working environment. The capacity of a fabric to allow perspiration in its vapor or liquid form to pass through it is evaluated as its water permeability. This is significant for clothes intended for use in high intensity activities where people perspire excessively. Fabrics that are able to breathe are capable of providing additional heat loss through evaporating dampness in their layers. If the fabric layers are not able to move moisture, sweat will be drenched between the skin and cloth. This causes heat buildup causing discomfort, wet skin, and clothes adhesion to the skin causing chill effect. The tactile aspect of comfort is related with the surface and mechanical properties of the fabric such as prickliness, itchiness, stiffness, softness, smoothness, roughness and scratchiness (Özgüney et al. 2009). For years, the fabric sensorial evaluation have been a subject of many studies but still needs more understanding for comfort improvement (Bensaid et al. 2006; Das and Ishtiaque 2004; Sülar and Ayşe 2007). 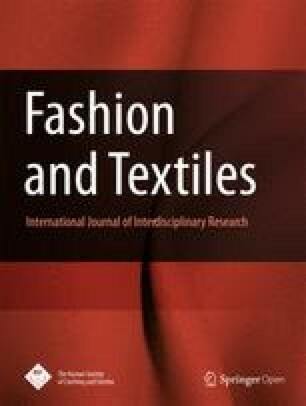 Sensorial properties are influenced by the textile materials, which include fiber content, yarn properties, fabric structure, and finishing treatments (Kayseri et al. 2012; Özdemir 2017; Raja et al. 2015). The fabric shear properties influence drape, pliability and handling of woven fabrics (Schwartz 2008). Shear angle is one of the main criteria for characterizing the formability of fabrics. The shear property is helpful because it enables fabric to undergo complex deformations and to conform to the body shape. The ability of a woven fabric to undergo shear deformation is a necessary condition for a comfortable fitting on to a three dimensional body surface. This can be evaluated by fitting the fabric onto a spatial surface and increasingly applying shearing force until the critical shearing angle is reached where the specimen starts to buckle and wrinkle. Researchers (Bach-y-Ray and Stephen 2003; Bensaid et al. 2006; Bishop 1996; Demiryürek and Uysaltürk 2013; Du and Yu 2007; Jeguirim et al. 2010; Mooneghi et al. 2014) have investigated the effect of fibers, fiber blend ratios, fiber morphology, yarn parameters, finishing treatments and fabric constructions on the hand feel properties of knitted and woven fabrics. Cay et al. (2007) showed that the fabric density has a significant effect on the handle properties of woven fabrics while Aliouche and Viallier (2000) proved that yarn hairiness affects the tactile fabric properties such as surface roughness and fabric compression. Yan et al. (2000) investigated the effect of fabric bleaching on mechanical properties and concluded that bleached fabrics have a coarse handle and a lower fullness than unbleached fabrics. Manich et al. (2006) examined the effects of finishing processes on the woven fabrics compression properties. They found that finishing treatment on greige fabric leads to fuller and more compact fabric structure given the increase in fabric density. Effects of yarn count and the weave structure on handle properties have also been investigated (Özgüney et al. 2009) and the results showed that bending stiffness and compression of the fabrics produced with higher Tex are superior than that of the fabrics produced with lower Tex compact ring spun yarns. Fabric weave structure has a significant effect on the bending rigidity and compression of the fabrics owing to the different yarn floats in the weave (Özgüney et al. 2009). In the same way, sensorial properties of different knitted structures of blended fabrics and the influence of fabric physical parameters, fiber content, fabric construction and moisture content on surface properties have been studied (Nawaz et al. 2011). It was seen that the single jersey structures are the excellent used next to skin and 100% wool and wool blended with bamboo gives better sensorial comfort as compare to 100% cotton, or 100% polyester. 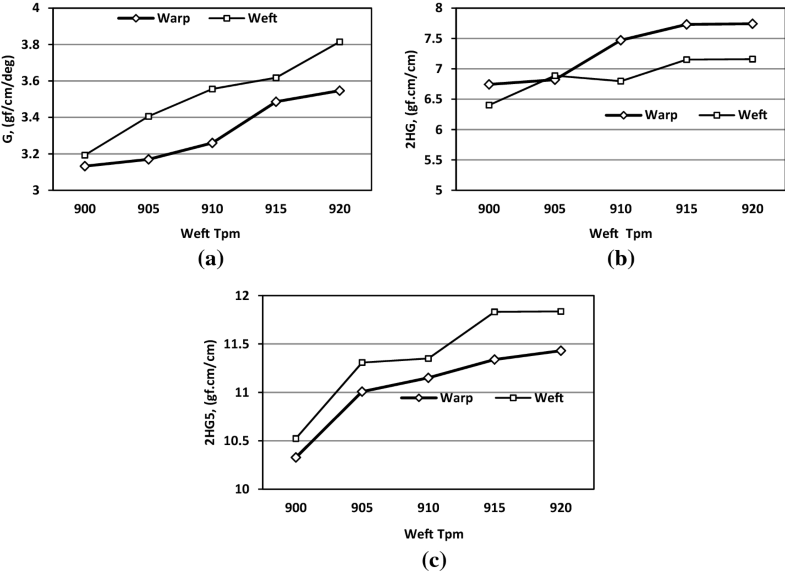 This research focuses on the effect of weft yarn twist level on 100% greige cotton woven fabrics. Five cotton fabrics were woven with incremental weft yarn twist levels and their tensile and shear strength, pure bending, compression, surface friction and roughness were evaluated using Kawabata Evaluation System (KES) and compared. Water permeability and their wicking ability were also evaluated since they also affect the comfort of fabrics. Five 100% woven cotton fabrics made from 900, 905, 910, 915 and 920 twist per meter (TPM) weft yarns were manufactured in Bahir Dar Textile Share Company. The samples were produced from similar warp yarn parameters but different TPM on the weft yarn. Ring spun yarns were used to produce the woven samples whose properties are shown in Table 1. As shown in Table 1, all samples were made from 20 Ne warp yarns with 915 TPM. The thread density was 26 and 20 yarns/cm in warp and weft direction, respectively. The variation was only in the twist level of the weft yarn. Kawabata Evaluation System (KES) was used to evaluate the sensorial comfort of fabrics which included tensile, shear, pure bending, compression, surface friction and roughness. Before testing, the samples were conditioned for 24 h at 20 °C and 65% RH. For every test property (20 × 20) cm fabric specimen area was prepared. KES-FB1-AUTO-A was used to evaluate the tensile and shear properties of the samples. The tensile property was tested in both warp and weft direction while shear property was measured at various angles to the direction of the yarn, causing individual yarns to pull against one another as they would under normal use on the finished garments. The instrument measured the load–extension characteristics of a fabric sample of (50 × 200) mm gauge width using a load of 500 gf/cm (490 N/m). As shown in Fig. 1, the KES FB1-AUTO-A tester can test tensile linearity, tensile energy, tensile resilience and strain of fabrics. The formulas for calculating these parameters are shown in Eqs. (i)–(iv). where x is the extension. The KES-FB1-AUTO-A tester has a second mode of operation which measures the stress–strain characteristics of the same sample in cyclic shear deformation between a shear strain of ± 8°. Shear deformation is common during the wear process since the fabric needs to be stretched or sheared to a greater or less degree when body is in motion. The shear mechanism is one of the important properties influencing drapeness, pliability and handling properties of the woven fabrics (Schwartz 2008). For tensile and shear tests 5 test trials were performed for each sample. KES-FB2-AUTO-A tester was used to measure the bending properties of the woven fabric samples. During bending test, a fabric sample was mounted through a narrow slit followed by bending and the values of bending rigidity plus the bending moment were recorded. Two parameters that characterize the fabric bending behavior are its bending rigidity and bending hysteresis. Bending rigidity can be defined as the resistance of textile against flexion by its own weight or by external force while bending hysteresis is a measure of fabric’s ability to recover from bending. KES-FB2-AUTO-A tester measures the couple–curvature characteristics of a (200 × 10) mm sample in cyclic bending deformation between a curvature of 2.5 cm−1 and − 2.5 cm−1. The test specimen was fastened between clamps 10 mm apart. Five trials tests were measured for each sample in both warp and weft direction. 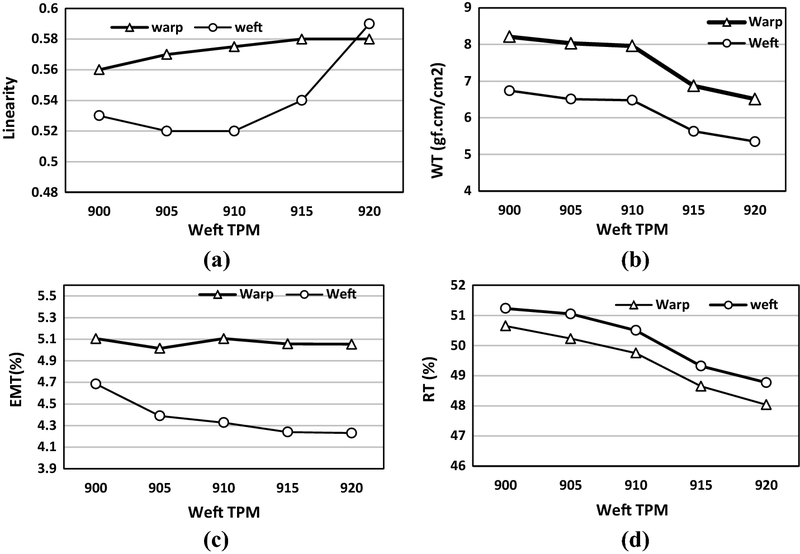 The compression properties of fabrics is affected by a number of factors like the compression properties of the component warp and weft yarns (Mukhopadyhay et al. 2002). Pressure–thickness properties of fabric samples were measured using KESFB3-AUTO-A tester with a pressure of 50 gf/cm2 (4.9 kPa). The tester was used to evaluate all compression properties including fabric thickness, work of compression and recoverability of the fabrics. Five tests were performed for each type of sample. The compression properties were determined by exerting force on the samples using a pressure plate which acts as a probe. Sensorial properties of a fabric can be evaluated effectively using surface roughness property. This property was tested in a KESFB3-AUTO-A surface tester where the coefficient of friction was assessed by passing a metal probe over a mounted fabric sample and the second probe measured the geometrical roughness. Sample fixed on a sample plate moved horizontally at a speed of 1 mm/s. As the sample moved, a friction contact probe (dynamic friction measurement sensor) and a roughness contact probe (roughness measurement sensor) measured the frictional force working in the opposite direction to the sample movement and a height of the sample surface as the probe traces along it. In the friction measurement, the dynamic friction was measured using a 1-point contact method with the friction probe of a 10 mm square size directly connected to the detection unit by applying 50 gf vertical load on the probe. In the roughness measurement, a 5 mm long contact probe was passed perpendicularly against the 10 gf load which measured the asperity height of the sample surface as it travelled along. In this study, water permeability test was done in accordance to ES ISO 811 standard. A hydrostatic head was used to measure the resistance of water passage through the fabric. A specimen was subjected to a mounting water pressure on one face, under standard conditions, until incursion occurred in three places. The pressure at which the water penetrates the fabric at the third place was recorded. Moisture swelling in clothing is a vital factor negatively affecting the comfort of the wearer (Lee 2014). Wicking ability was evaluated using vertical wicking AATCC 197 test method. Each fabric sample was cut into (250 × 25) mm strips and suspended vertically with the bottom end in a reservoir of 0.25% NaCl solution in order to imitate the properties of human sweat (Simile 2004). The fabric wicking ability was evaluated using the rise in water height after a given time and only was tested in the weft direction. As seen in Fig. 2a, as the weft yarn twist level increased from 900 TPM to 920 TPM, the value of tensile linearity (LT) increased. This was observed in both the warp and weft direction. As the value of LT approached to 1, the fabrics became harder and stronger. The reason for the increase in LT value was the increase in the twist level on the weft yarn. This was because as the turns per meter increased, the yarns became denser and strength increase and thus stronger fabrics. Tensile energy (WT) shows the softness of the fabric and can be used to evaluate the sensory properties of a fabric (Kayseri et al. 2012). The softer the fabric, the easier it is to stretch and will exhibit higher WT values. As shown in Fig. 2b, the WT value decreased in both the warp and weft direction with the increase in weft yarn twist level. The fabric with 900 TPM had the highest WT values meaning it was more stretchable than others, while fabrics with 920 TPM had the lowest WT values and less stretchable than other fabric samples. In the same way, the strain (EMT %) reduced in both the weft and warp direction as weft yarn twist level increased as shown in Fig. 2c. The decrease was more observable in the weft direction because the twist change happened in this direction. 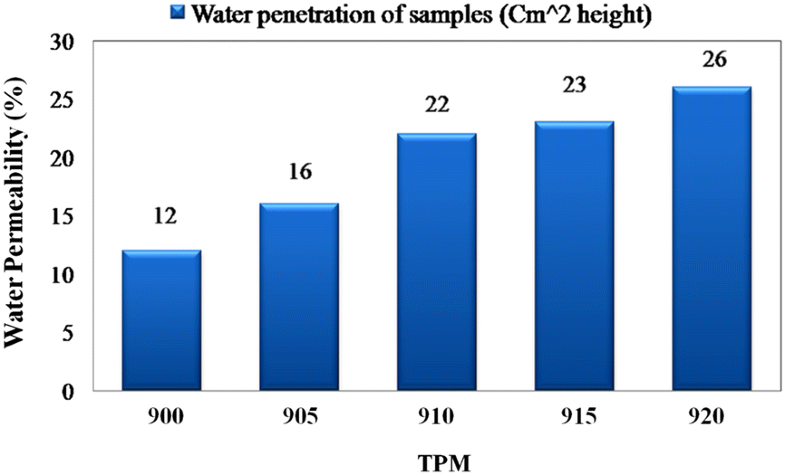 RT (tensile resilience properties) also decreased with the increase in TPM from 900 to 920 TPM as shown in Fig. 2c. This was also observed in both the weft and warp direction. The fabric sample developed with 920 TPM had the least tensile resilience (48.04% in warp and 48.77% in weft direction). As RT % value approaches 100%, the fabric gives better tensile resilience property and thus better comfort. Figure 3 shows shear rigidity (G) results, hysteresis of shear force at 0.5° (2HG) and hysteresis of shear force at 5° (2HG5) test results. 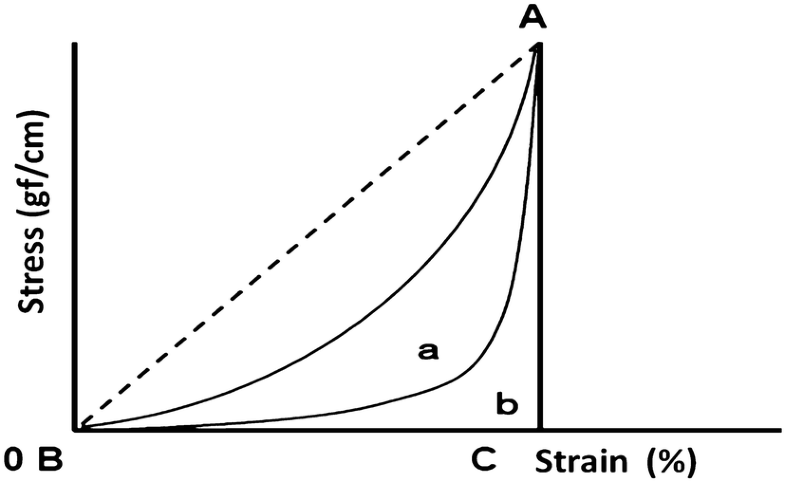 As shown in the figure, shear properties were affected by the increase in yarn twist level. As seen in Fig. 3 (a), the value of G increased with the increase in the weft yarn twist level. From the results, the fabric with 920 TPM was less deformed while the fabric with 900 TPM was more deformed thus more comfortable. As seen in Fig. 3b, the fabric sample with 920 TPM had the highest 2HG (7.742 warp and 7.160 gf cm/cm weft) values which mean that it had low recoverability than fabrics with lower TPM. In the same way, 2HG5 value of fabric with 920 TPM showed less shear recovery (11.143 warp and 11.836 weft) gf cm/cm while fabric made from 900 TPM showed high shear recoverability (10.328 warp and 10.523 weft) gf cm/cm as shown in Fig. 3c. 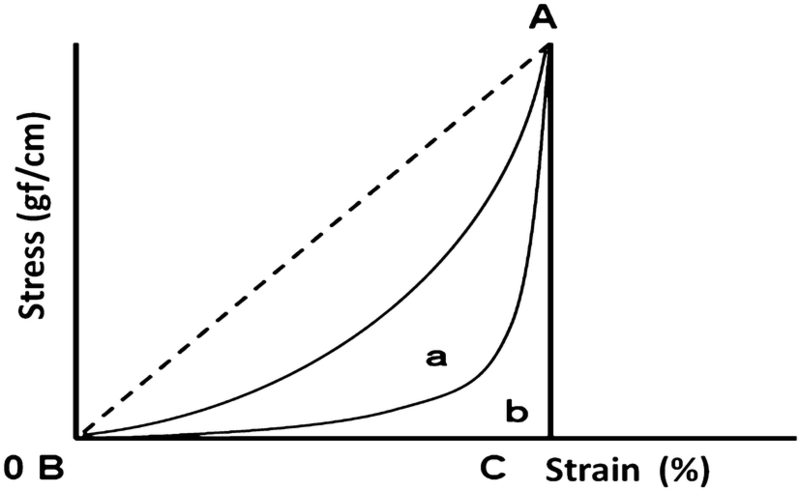 Bending (B) is correlated with “softness” and “rigidity” felt when an object is bend. The larger the B, the harder the object is to bend. As seen from Fig. 4a, bending rigidity of fabrics with lower twist levels was lower while fabrics with 920 TPM had higher rigidity of 0.145 and 0.115 gf cm2/cm in warp and weft directions respectively. This indicated that the bending rigidity of fabrics increased proportionally with the yarn twist level making them less comfortable. In addition to bending rigidity, bending resilience behaviors (2HB) were evaluated. 2HB correlates with “hysteresis” (resilience), which is observed when the object recovers to its original position or shape after being bent. The larger 2HB (wider 2HB width) showed less hysteresis (recoverability) while on the contrary, a smaller 2HB (narrower 2HB width) showed better hysteresis (recoverability). Figure 4b shows that fabrics with 920 TPM had less recoverability and the highest resilience was recorded for fabric made from 900 TPM twist level. Fabric thickness is normally assessed by measuring the distance between two parallel plates separated by a fabric sample, with a known pressure applied. Fabric compression characteristics depend on several factors such as compression properties of the constituent warp and weft threads plus the structure of the fabric (Mukhopadyhay et al. 2002; Saville 1999). The thickness and compression properties of the cotton fabric samples woven with different TPM weft yarns are shown in Table 2. As per the Kawabata fabric evaluation system (KES-FB3-AUTO-A) compression evaluation includes linearity compression (LC), compression energy (WC), compression resilience (RC) and fabric thickness (T). The softer the sample, the easier to compress and the WC value increases. For LC, as the values approaches 1, it becomes harder to compress while for RC, as the value approaches 100%, it shows better resilience. Fabrics composed of yarns with higher twist level are known to have higher bending stiffness and less compressibility (Behery 2005). However, this study proof that the fabrics with weft yarns of 900 TPM had lower LC and higher Properties of WC, RC and T while fabric made from 920 TPM had the least WC, RC and T but higher LC. The fabric with Less TPM were softer thus comfortable than the fabrics with higher TPM. Table 3 shows the surface properties of the studied samples. It includes μ (coefficient of friction), MMD (mean deviation of μ) and SMD (geometrical roughness) at 20 mm distance. For both surface behaviors, the samples with 920 TPM weft yarn showed higher values while the samples with 900 TPM weft yarns had the least in μ, MMD and SMD properties. There is a relationship between μ/MMD/SMD and human sense of touch (slipperiness). The first parameter μ is correlated with the slipperiness felt when the surfaces of the objects are touched and a larger μ value designates less slipperiness. MMD is correlated with the smoothness and roughness felt when the surface of objects is rubbed and a larger MMD value indicates a rougher surface. SMD indicates the surface physical evenness and a higher value shows uneven surface. As described above, the sample developed with 920 TPM weft yarns was less slippery (0.264 warp and 0.199 weft direction), rougher (0.026 warp and 0.020 weft) and less even (2.643 warp and 1.998 weft) than other fabrics samples. On the contrary, fabrics woven with 900 TPM weft yarns had very good slipperiness, smoothness and even surface compared to other samples. It can be concluded that as the yarn twist level increases, the slipperiness and surface evenness reduces while the roughness increases affecting the clothing sensorial comfort. where p is water vapour, qs and qo are heat flow values with and without sample, respectively. The yarns cross-section, porosity and surface characteristics of the fibers play an important role in this property. As seen in Fig. 5, as the yarn twist level increases, the water permeability (penetration) also increases significantly. The water permeability of the 100% cotton fabrics with low twist weft yarns was the lowest due to hairy yarns which reduced porosity in the woven fabrics. Similarly because of this, the fabrics produced from yarns with high twist level had the less hairy surface and more porous structure thus higher water permeability. As observed, the water permeability values increased from 900 to 920 TPM samples. The transport of evaporative perspiration and liquid perspiration (via wicking) play important roles in maintaining thermo-physiological comfort (Das et al. 2007). The liquid is coerced into capillary spaces by the capillary forces. These forces are influenced by the fiber surface properties and pore structure thus in turn determines the wicking properties. As shown in Table 4, wicking result of cotton fabrics weaved with highly twisted weft yarns were low and vice verse when the weft yarns twist level reduced. As observed in Table 4, all samples of wicking results were zero after 15 min. After 30 min, fabrics made from 900 and 905 TPM weft yarns showed 0.1 cm increase in wicking height and for other samples, there were no change. Fabric wicking height of 0.3 cm was recorded after 60 min for fabric manufactured with 900 TPM weft yarns. Based on this study results, it can be explained that the mechanism of moisture transport in textiles is due to wicking of liquid in capillaries which is controlled by the capillary diameter and the surface energy of the wicked material. Since the surface energy of all samples was the same due to the fact that they are all made of cotton yarns, then the disparity can be credited to their capillaries diameters. Capillary diameters is connected to the structure and dimensions of inter and intra thread pores. In view of the fact that the density of all the samples was the same, the variations in wicking rates can be largely attributed to the difference in structure of the weft yarns. This was caused by the difference in twist levels for each sample type which affected both inter- and intra-thread pores. Wicking fabric is a term most commonly associated with performance of apparel cloths and it illustrates the cloths ability to breathe and keep the user’s skin dry from sweat thus more comfortable. The effect of twist level on sensorial properties of 100% cotton woven fabric was studied and analyzed. It was observed that the change in weft yarn twist level affected the tensile, shear, bending, compression, permeability and wicking fabric properties. As the twist level increased, the tensile properties also increased but the shear properties decreased reducing the sensorial comfort. The compression properties diminished with the increase in twist level while the bending rigidity and surface roughness increased also reducing the sensorial comfort. Fabric permeability increased with the twist level allowing more air circulation improving sensorial comfort while wicking ability reduced. All authors tested and analyzed the data. All authors read and approved the final manuscript. The research was self funded.